In our 1XBet review, we have already provided you with an in-depth analysis of the Russian bookmaker’s sports offer as well as the many betting, depositing, and withdrawal options that customers find at 1XBet. In the following paragraphs, however, we want to take a closer look at 1XBet’s mobile offer. 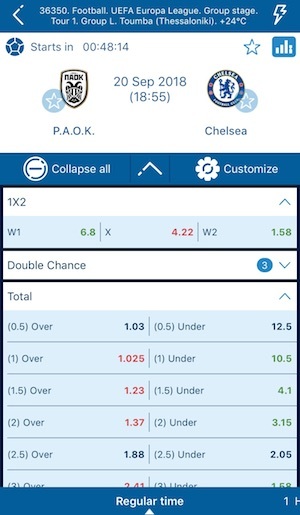 We will discuss, whether the 1XBet app version is up to par in terms of usability and betting options, and we will also discuss the advantages of mobile betting with 1XBet as well as potential drawbacks. Looking for a way to bet on the road? Get the 1XBet App here! 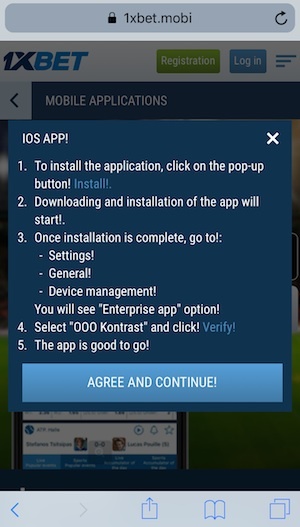 Just click on “Trust ‘KONTRAST, OOO” and confirm in the pop-up window, and the 1XBet app is ready to go on your mobile device. When you open the app now, you will receive instructions on how to set your favorite sports, as well as other tips that will facilitate the app use. If you want to get straight into it, just tap “ignor” and you will get to the sportsbook. At first glance you can already see that the native app is certainly worth the rather complicated installation procedure. In comparison to the stripped down mobile version of the bookie’s desktop view, the 1XBet app offers a great deal more options. To begin with the most important detail, you have a header and a footer menu that allow for quick navigation across different types of sports and special features, such as the accumulator of the day, or popular events in sports. Et voilà, the 1XBet app is ready to go and ready to be explored. However, there’s a few more steps to take before you can start betting. In the next paragraphs, we will show you how the registration works and how deposits are made, because obviously you will need an active account with credit to be able to wager. If you have already taken these steps in the 1XBet desktop or mobile browser version, you can skip these sections, and go straight to our analysis of the 1XBet app usability. The registration in the 1XBet app is fairly straightforward. 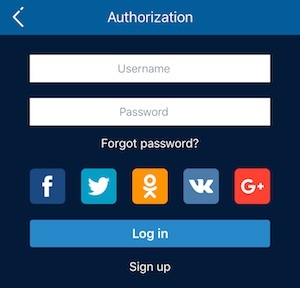 In the app the default option is to do a quick registration using your mobile phone. In this case you just enter your phone number and the currency in which you want to bet. You can also enter a promo code. 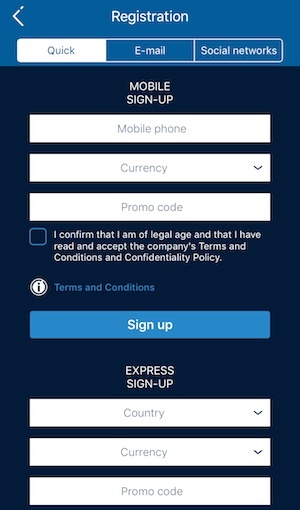 The registration is then verified by entering the code that you received on your mobile device. Further options for registration are via e-mail or social networks or the 1XBet express registration. 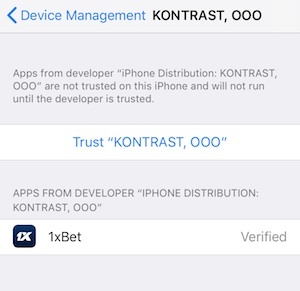 However, the latter option requires you to verify your account at a later stage as well. So it does not really make things faster. Either way, the 1XBet registration should not pose a challenge, so let’s move on to making deposits at 1XBet. In order to make your first wagers at 1XBet, you obviously need some credit in your account. In terms of depositing options, you probably won’t find a better bookie than 1XBet. The selection of payment methods is simply astounding. 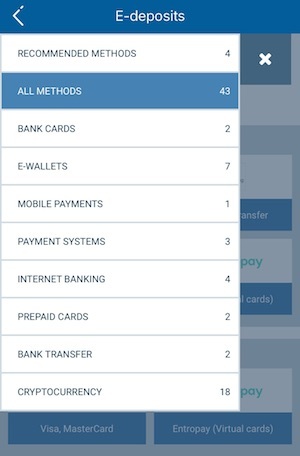 In our test, we were able to choose from a total of 43 different payment options for our first deposit. With a minimum deposit of 1€/GBP, you also don’t have to commit to the bookie. If you want to benefit from the 100% 1XBet Bonus, however, you will have to deposit a larger sum in order to get a higher bonus credit. Get Your 1XBet First Deposit Bonus! As you can see, 1XBet offers a variety of credit cards, pre-paid cards, such as paysafecard, e-wallets, and even crypto currencies. In fact, 1XBet was one of the first bookies that allowed for crypto transactions with Bitcoin. By now, there is a total of 18 crypto currencies that you can choose from. However, it is important to understand that crypto currencies are always converted into € or GBP (or your country’s currency). So technically, you cannot bet Bitcoins at 1XBet. Nonetheless, the bookie’s range of depositing options is second to none. The log in/sign in at 1XBet pretty much follows standard procedures. One extra feature is the log in option via social media. As we have mentioned in the paragraph on the registration before, 1XBet allows new customers to register via their social media accounts, such as facebook, google+, and twitter. If you prefer to log out before closing the app, you can do so by tapping the menu button in the top left corner. At the bottom of the menu you will find the respective button for signing out of your 1XBet account. Don’t forget that if you have registered at 1XBet using the express option, you should modify your log in data. In terms of usability, the 1XBet native app certainly left a good impression on us. In fact, we found the app to be a lot better organized than the bookmaker’s desktop version, which appears a bit cluttered with betting markets on the front page. 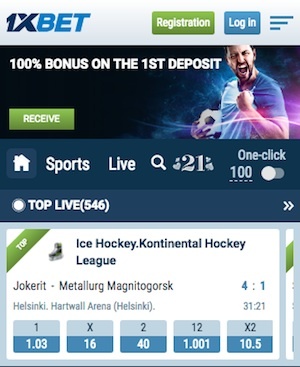 In contrast to the 1XBet desktop version, the native app has individual event highlights featured on the starting page, and just two menu bars – one header menu for different sports and one footer menu for popular events and accumulator of the day offers. In the header menu you can explore different types of sports by swiping left. Unfortunately, the icons do not always give away what kind of sport they represent, so it will take some time to find one’s bearings. If you are unsure, just tap the cog on the right and you will get a list of the various sports offered at 1XBet. 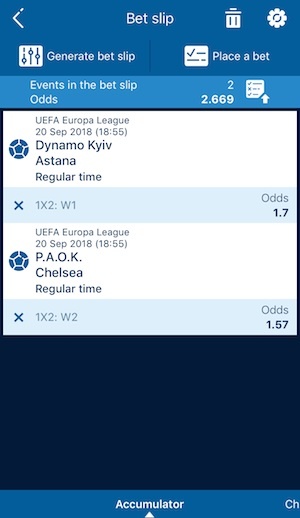 Betting in the 1XBet app is really easy. Due to the great design of the native app, it is very easy to navigate across sports and different competitions. Furthermore, the various markets per sporting event are also very well organized. Just tap on the respective event and hold for a second, and you will get straight to the betting markets. Don’t forget to regularly check our betting tips in order to stay updated about the best picks of the day. 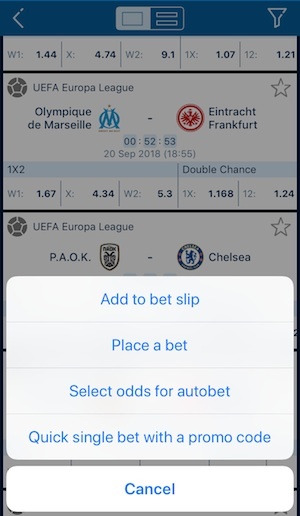 So you have the option of adding your choice to the bet slip to accumulate a multi-bet, to place the bet straight away, to select the odds for autobet, or to place a quick single bet using a promo code (e.g. for price boosts). In order to find out, which option to choose, you should check out our different betting strategies. A little research here and there can help you improve your turnovers significantly. If you decide to select several odds from several betting markets to place a multi-bet, you will find all the betting options on your bet slip. These range from accumulators, to system bets and many more. Overall, we can certainly recommend downloading the 1XBet app and apk. Even though, the installation process might be a bit more complicated than what app users are used to, it is definitely worth the effort. 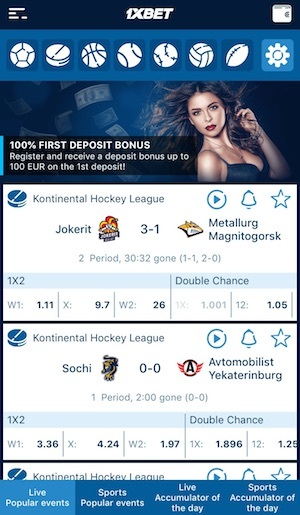 The 1XBet native app offers pretty much everything a sports betting fan can hope for: From a great variety in payment options to a broad range of events and competitions in over 130 different kinds of sports. Despite the vast offer, 1XBet app users will find it very easy to navigate across the sportsbook and the various betting options per event. Furthermore, the bet slip is well organized and allows for a variety of bet types, ranging from accumulators to system and chain bets.